The heart pumps oxygenated and deoxygenated blood throughout the body in a complex system of arteries, veins, and capillaries. As blood is pumped away from the heart, it travels through the aorta to arteries, aterioles, and the capillary beds. Blood flow through the capillary beds reaches almost every cell in the body and is controlled to divert blood according to the body’s needs. After oxygen is removed from the blood, the deoxygenated blood flows to the lungs, where it is reoxygenated and sent through the veins back to the heart. As the heart pumps, blood is pushed through the body through the entire circulatory system. Oxygenated blood is pumped away from the heart to the rest of the body, while deoxygenated blood is pumped to the lungs where it is reoxygenated before returning to the heart. 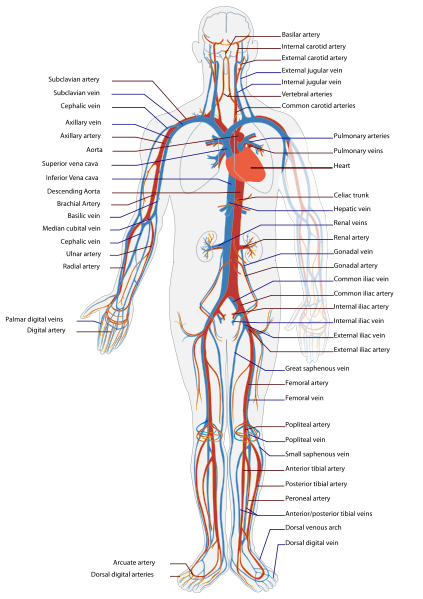 Circulatory system: This illustration of the circulatory system shows where blood flows in the body. Red indicates oxygenated blood, while blue indicates deoxygenated blood. 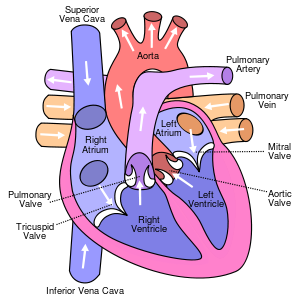 With each rhythmic pump of the heart, blood is pushed under high pressure and velocity away from the heart, initially along the main artery, the aorta. In the aorta, the blood travels at 30 cm/sec. From the aorta, blood flows into the arteries and arterioles and, ultimately, to the capillary beds. As it reaches the capillary beds, the rate of flow is dramatically (one-thousand times) slower than the rate of flow in the aorta. While the diameter of each individual arteriole and capillary is far narrower than the diameter of the aorta, the rate is actually slower due to the overall diameter of all the combined capillaries being far greater than the diameter of the individual aorta. View of the heart: This front view of the heart shows the direction of blood flow to and from the heart. Blood leaves the heart through the pulmonary artery and aorta, while blood enters the heart through the two venae cavae and pulmonary veins. The slow rate of travel through the capillary beds, which reach almost every cell in the body, assists with gas (especially oxygen and carbon dioxide) and nutrient exchange. Blood flow through the capillary beds is regulated depending on the body’s needs and is directed by nerve and hormone signals. For example, after a large meal, most of the blood is diverted to the stomach by vasodilation (widening) of vessels of the digestive system and vasoconstriction (narrowing) of other vessels. During exercise, blood is diverted to the skeletal muscles through vasodilation, while blood to the digestive system would be lessened through vasoconstriction. The blood entering some capillary beds is controlled by small muscles called precapillary sphincters. A sphincter is a ringlike band of muscle that surrounds a bodily opening, constricting and relaxing as required for normal physiological functioning. If the precapillary sphincters are open, the blood will flow into the associated branches of the capillary bed. If all of the sphincters are closed, then the blood will flow directly from the arteriole to the venule through the thoroughfare channel. These muscles allow the body to precisely control when capillary beds receive blood flow. At any given moment, only about 5-10 percent of our capillary beds actually have blood flowing through them. Precapillary sphincters: (a) Precapillary sphincters are rings of smooth muscle that regulate the flow of blood through capillaries; they help control the blood flow to where it is needed. (b) Valves in the veins prevent blood from moving backward. After the blood has passed through the capillary beds, it enters the venules, veins, and finally the two main venae cavae (singular, vena cava) that take blood back to the heart. The flow rate increases again, but is still much slower than the initial rate in the aorta. Blood primarily moves in the veins by the rhythmic movement of smooth muscle in the vessel wall and by the action of the skeletal muscle as the body moves. Because most veins must move blood against the pull of gravity, blood is prevented from flowing backward in the veins by one-way valves. Thus, because skeletal muscle contraction aids in venous blood flow, it is important to get up and move frequently after long periods of sitting so that blood will not pool in the extremities. Blood pressure is the pressure of blood against the blood vessel walls during the cardiac cycle; it is influenced by a variety of factors. Normal blood pressure for a healthy adult is 120 mm Hg during systole (peak pressure in the arteries ) and 80 mm Hg during diastole (the resting phase). Blood pressure is regulated in the body by changes to the diameters of blood vessels in response to changes in the cardiac output and stroke volume. Factors such as stress, nutrition, drugs, exercise, or disease can invoke changes in the diameters of the blood vessels, altering blood pressure. Blood pressure is the pressure of the fluid (blood) against the walls of the blood vessels. Fluid will move from areas of high to low hydrostatic pressures. In the arteries, the hydrostatic pressure near the heart is very high. Blood flows to the arterioles (smaller arteries) where the rate of flow is slowed by the narrow openings of the arterioles. The systolic pressure is defined as the peak pressure in the arteries during the cardiac cycle; the diastolic pressure is the lowest pressure at the resting phase of the cardiac cycle. During systole, when new blood is entering the arteries, the artery walls stretch to accommodate the increase of pressure of the extra blood. During diastole, the walls return to normal because of their elastic properties. Blood pressure values are universally stated in millimeters of mercury (mm Hg). The blood pressure of the systole phase and the diastole phase gives the two readings for blood pressure. For example, the typical value for a resting, healthy adult is 120/80, which indicates a reading of 120 mm Hg during the systole and 80 mm Hg during diastole. 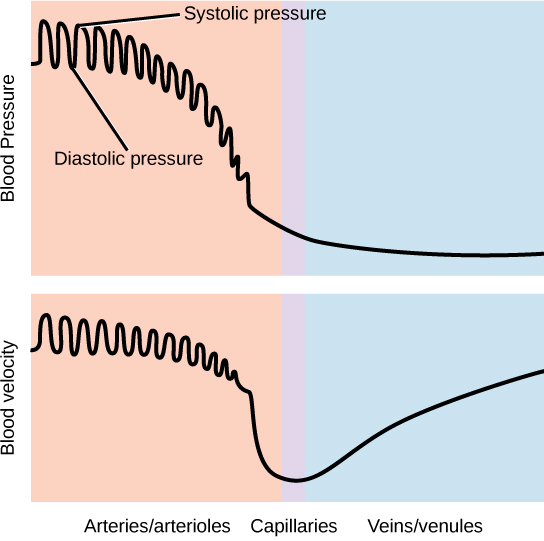 Relationship between blood pressure and velocity: Blood pressure is related to the blood velocity in the arteries and arterioles. In the capillaries and veins, the blood pressure continues to decease, but velocity increases. Throughout the cardiac cycle, the blood continues to empty into the arterioles at a relatively even rate. However, these measures of blood pressure are not static; they undergo natural variations from one heartbeat to another and throughout the day. The measures of blood pressure also change in response to stress, nutritional factors, drugs, or disease. The body regulates blood pressure by changes in response to the cardiac output and stroke volume. Cardiac output is the volume of blood pumped by the heart in one minute. It is calculated by multiplying the number of heart contractions that occur per minute (heart rate) times the stroke volume (the volume of blood pumped into the aorta per contraction of the left ventricle). Therefore, cardiac output can be increased by increasing heart rate, as when exercising. However, cardiac output can also be increased by increasing stroke volume, such as if the heart were to contract with greater strength. Stroke volume can also be increased by speeding blood circulation through the body so that more blood enters the heart between contractions. During heavy exertion, the blood vessels relax and increase in diameter, offsetting the increased heart rate and ensuring adequate oxygenated blood gets to the muscles. Stress triggers a decrease in the diameter of the blood vessels, consequently increasing blood pressure. These changes can also be caused by nerve signals or hormones; even standing up or lying down can have a great effect on blood pressure.